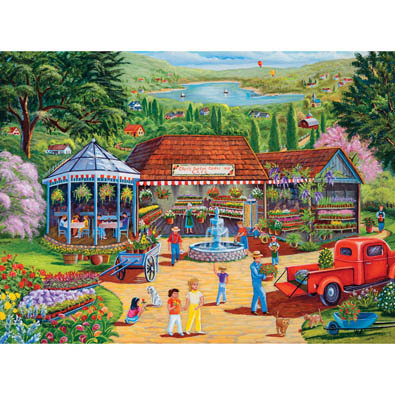 Garden centre is a 1000 piece jigsaw puzzle designed by artist Christine Carey. Visitors and townsfolk have arrived at Ellen's Garden centre and Cafe to purchase beautiful flowers and stop for lunch in the colourful gazebo. Set in on a hillside of town overlooking a mountain lake which is dotted with country homes. This 1000 piece jigsaw is designed by Abraham Hunter and measures 51cm x 68cm. A flock of birds make themselves at home on a bird feeder in branches of flowers. Available in two piece counts. This 1000-piece jigsaw is designed by Parker Fulton and measures 51cm x 68cm. This puzzle depicts a traditional Japanese tea room. Swans bath in the pond out the window. Available in two piece counts.